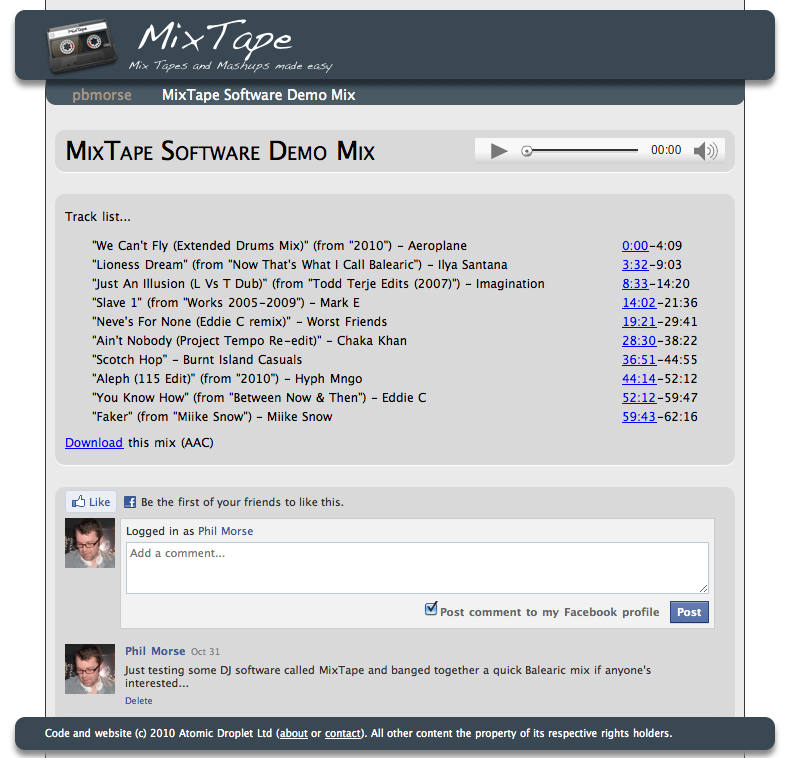 Mixtape software has a clean and visual interface, but looks absolutely nothing like normal DJ software. If you’ve ever wanted a way to just get a mix “down”, quickly and easily, without having to keep re-recording it because you’ve messed up, then MixTape (US$69/US$39) may be the software you’ve been looking for. This software actually dropped into my inbox just this weekend, coincidentally at exactly the same time as I was trying to put together a quick demo mix for a radio station of a musical style I’m pitching to them for a show. 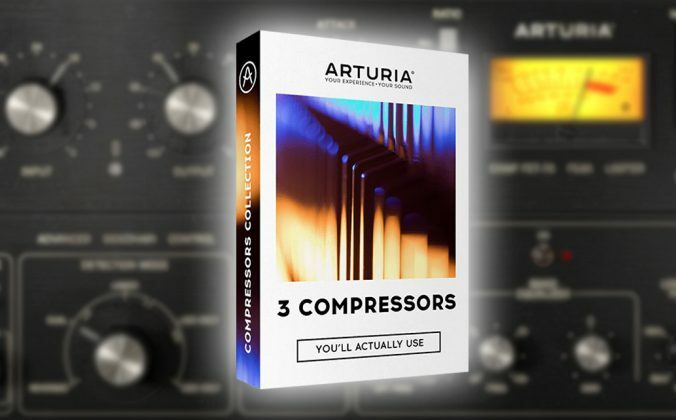 So rather than just do a review, I thought I’d create that actual mix using it and report back as to how I got on – as well as giving you a chance to hear what I managed to do with it. OK, so at 8am this Saturday I installed MixTape on my computer. It’s a small program that comes in Pro (US$69) and Lite (US$39) versions. You can get a month’s free trial on either version to try it out from the developer’s website. We are looking at the Pro version. 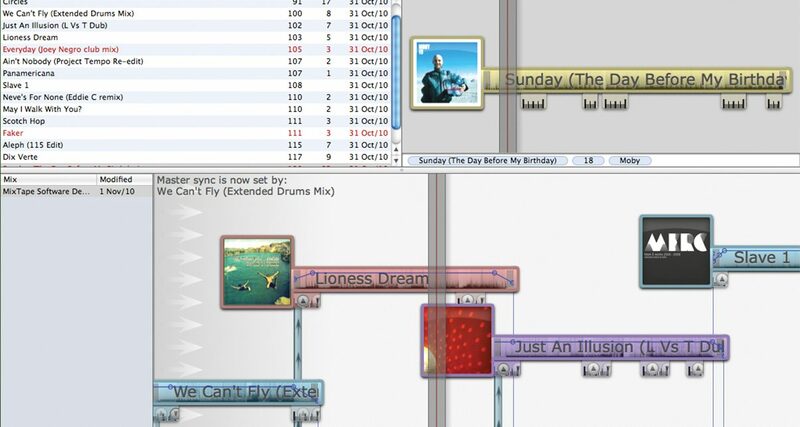 The way it works is very different to DJ software you may be used to. There are no decks and no mixing controls. In fact, upon loading, there’s pretty much nothing – just a few empty windows. 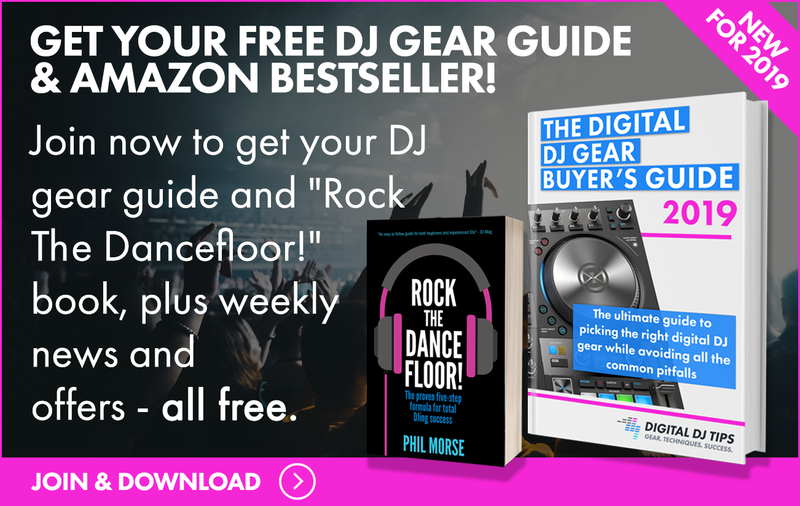 While you can actually DJ live with this software as it does have a preview function, I am guessing it will be of interest mainly for automating your DJ mixes to make mixtapes with – the clue’s in the name. That’s what we’re going to go through now. The first thing to do is to get some music into it, and you do that by drag and dropping or navigating to your tunes, either from a folder or from iTunes. They are analysed much like “normal” DJ software analyses tunes, and then they appear in the top left-hand window when they’re ready. 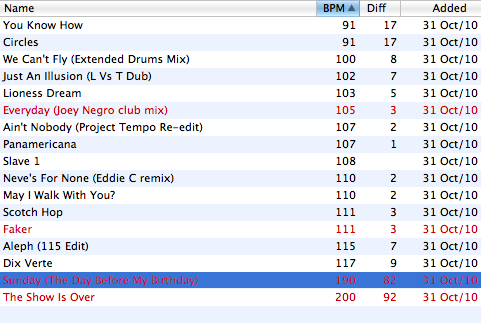 The BPM shows here, but if your tracks are already BPMed, it will ignore that, re-analysing them for itself. It got all but one of my tracks perfectly on the button, but the one if got wrong it got really wrong, and I couldn’t find a way to correct this – you can only double or halve the program’s guess of BPM, as far as I could tell. I ended up leaving the track out of my mix. The library. Red indicates tracks that haven’t been ‘beatgridded’ yet. It would be nice to be able to choose ID3 fields manually. 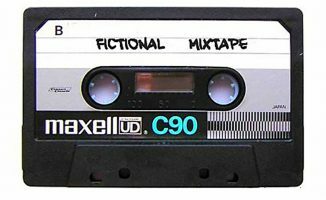 You can’t choose the fields it shows here – apart from the BPM, you get the title, the difference between the current BPM of your mixtape and the tune’s own BPM (more later), and the date added. I would like to be able to add the artist here and definitely the key or the comments tag – I mix in key and have that information in the ID3 tags, and I don’t want to have to refer back to iTunes to get this. There is a preview window to the right of the library, to where you can drag a tune to give it a quick listen without dropping it into your mix. You drag a “play head” across the tune and can use the spacebar to play/pause it here. 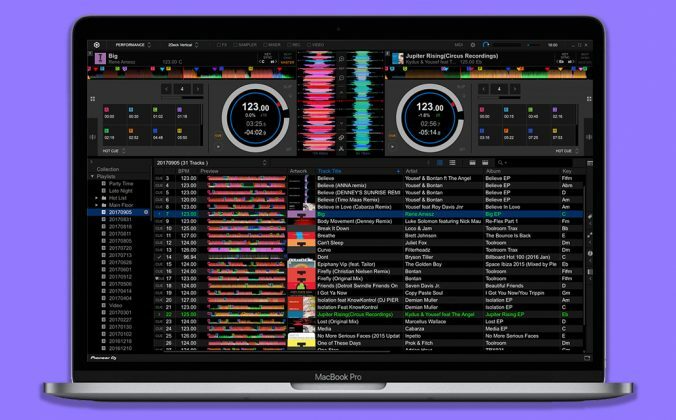 If you were DJing live with the software, this is where you’d preview your music. You can also tag tracks here from here. 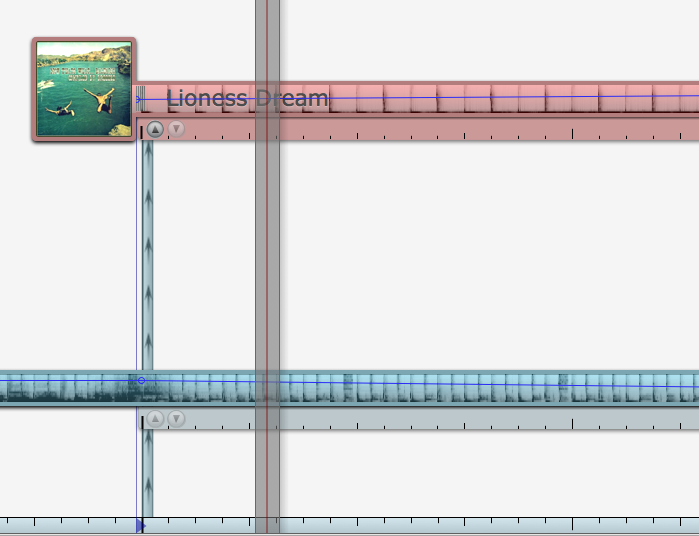 When you want to add a track to the mix, you drag it into the main (bottom) window. There’s also, by the way, a smaller window to the left of this that shows all the mixes you’ve got stored – you can show or hide this (or the other) windows at will. 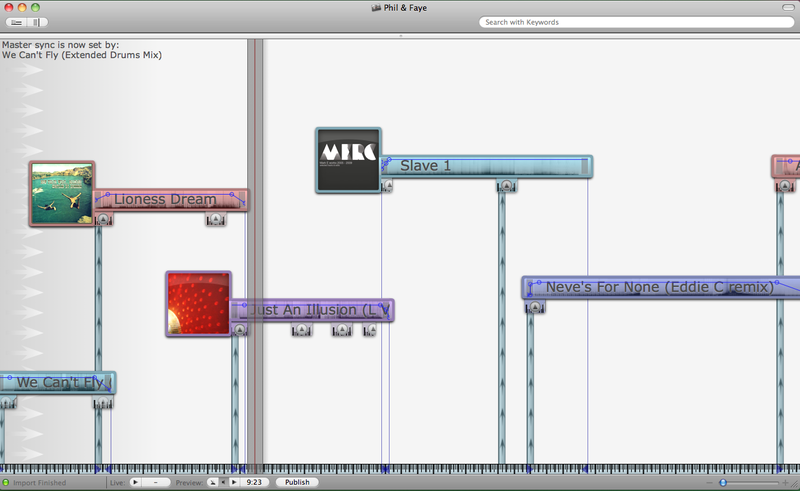 So, to start a mix, you double click a track from the library to load it, or drag it from the preview window. The track then appears in the main window along with its cover (if it has one). It looks good. If you’ve ever used a DAW (digital audio workstation) program like Cubase, you’ll be familiar with how the software works. It basically gives you a visual representation of your mix, with the tracks shown as complete, horizontal waveforms. You can drag the tracks around – left and right to alter where they appear in your mix, and up and down to keep them out of the way of each other visually. 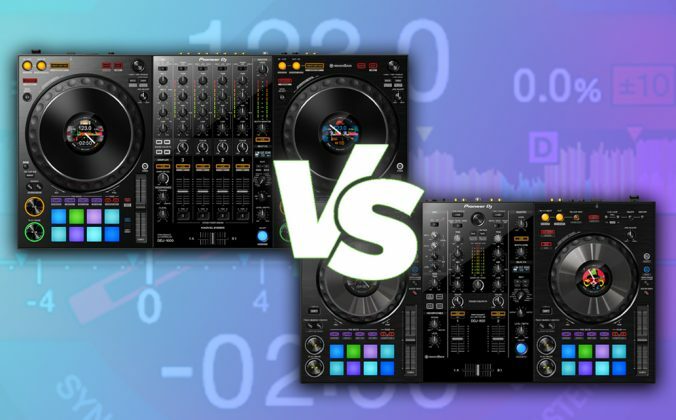 If you’ve used MixMeister software, you’ll be right at home here too – of all the DJ software out there, MixMeister is the program that this is closest to by a long way (apart from the price – MixMeister does much more but a performance version is seriously expensive). This window is brilliant fun to use – the tutorial videos advise not using the trackpad and to use the mouse instead to control it, but as I don’t have a mouse on my MacBook Pro I used the trackpad and found it amazingly easy. 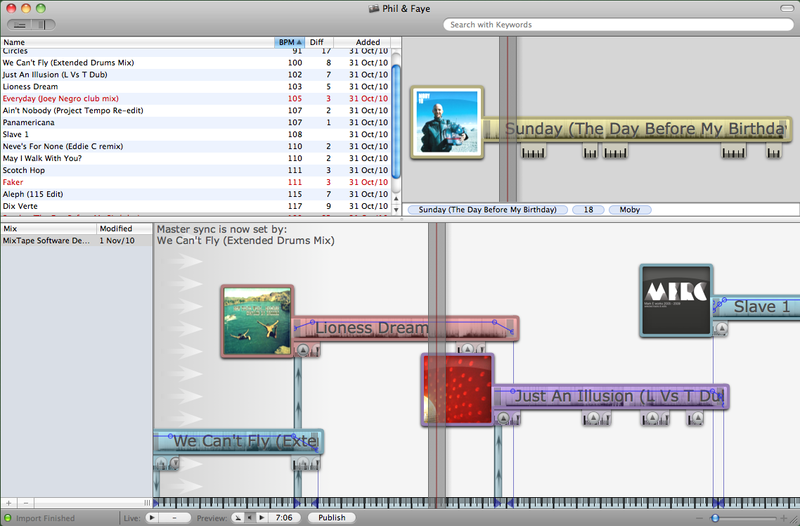 Two fingers up expands the tracks (zooms in) and two down zooms out showing you more of your mix. Two fingers left or right scrolls through the mix, and you can scrub through the mix rapidly by swiping your two fingers left or right on the trackpad. Building a mix up in the main work area is good fun, especially with multi-touch gestures on the trackpad letting you zoom around it. Once you get a track into the window, you have to do the equivalent of beatgridding it in Traktor or Serato. This is where you tell the program about where the main beats start, at points where you may want to mix the tune (this would normally be the beginning, maybe a break in the middle, and the end, although it’s up to you). You drag a kind of beat ruler along and get it lined up with the first beat, and you’ll want to do this on an 8 or 16 – it’s kind of hard to describe beatgridding but it’s easy enough once you get the hang of it. However, this is one area where the videos aren’t particularly clear, and it’s not helped by the fact that the tutorial videos have bedding music in the background while they’re trying to show you how to beatgrid music, with the second set of music in the foreground. Two sets of music playing at once make for a grating learn! However, as I say, once you get the hang of it, it’s pedestrian, so persevere – took me all of 10 minutes. Once you’re ready, you tell the software to save your beatgridding for that tune for future use. There’s a metronome to help you here as well. So – first tune beatgridded and on the block. You click a little down arrow on one of the beatgrid markers, and the “master tempo” – a bar of beats and measures along the bottom – is “locked” to the beats of that tune. Next job is to grab another tune from the library with a similar enough BPM, and plonk it somewhere near the end of the current one, beatgridding that too. This whole window, by the way, plays like a piano roll, with another “playhead” that you can drag around to tell it where to play. Here again you start and stop it again by using the spacebar (or clicking in the background). You can solo a particular tune by clicking just on that tune. It is weird at first, but it only takes an hour or two and a few referrals to the video instructions to get the hang of it, and it is really very easy after that. Be ready for the learning curve, though, as it isn’t immediately obvious what to do. A close-up of beatmatching two tunes. Note the new tune inheriting the master tempo from the grid at the bottom of the screen. 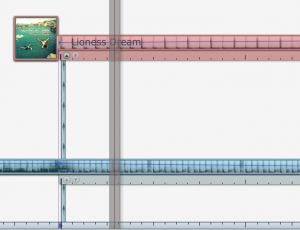 By zooming right in, dragging the playhead to the right place, and moving the new track’s waveform left or right, you can get the track to come in to the mix at exactly the right point. You can also specify at which point you’d like the new track to actually start (to knock out silence at the beginning, or to get rid of a beatless intro you don’t like – whatever) by dragging a little bar. The whole thing is a bit like movable waveforms from normal DJ software – you’re basically assembling a mix by “putting” the tunes where you want them on a work surface. When you get the tune where you want it, you can “pass the BPM baton” to that tune by clicking a little “up” arrow – this means that the new tune inherits the master tempo of the mix. Later on, you can tell the master tempo to be dictated by the new tune to square things up ready for the next mix. This is a weird concept and I’m still not sure I fully understand the reasoning for it, but funnily enoug you intuitively get the hang of it, and it is nicely represented visually. So we’re two hours in, and I’ve got two tunes beatmatched. Not bad. Now, you need to duplicate the use of the crossfader or volume faders here, and the way the software does that is by having a little horizontal line running through each waveform to represent volume. By adding pins to this line, you can alter the volume to have drastic changes, or smooth fade-ins and fade-outs. This is fiddly: It works when you get the hang of it, but it’s all too easy to accidentally change the volume of the whole track, and the representation as to how loud the track is is a visual one, so getting the column back to where you had it before is difficult. Room for improvement here. You carry on in this manner, getting your mix sounding right. There’s no “real time” pressure, and you can have as many goes and take all the time you want. This way, you build your mix up tune by tune, at your leisure. You listen back, move tunes around, add more tunes or acapellas etc as you like, and basically construct a mix in your own time. It is all very relaxed, and you’ll not find yourself wanting to use menus or anything like that – just as well as there’s nothing in them really. You can now publish your mix to the web: You get a lot of download minutes thrown in on the MixTape server for free, and by just hitting “publish” your mix is put on its own page, complete with track listings, and a URL you can give to people. It takes a few minutes, but after that it’s all done. This is cool, although being able to publish to MixCrate, SoundCloud, Mixcloud and so on too would be even cooler. What it will do, though, is publish a link on your Facebook account for you, and that’s a good addition. My mix, hosted on the MixTape server. Any comments on Facebook are automatically fed in at the bottom, which is a nice touch. Alternatively, you can push it back to your iTunes, or simply record it to your desktop. You’ve probably spotted that there are lots of things I haven’t spoken about here. I haven’t mentioned EQ, or effects, or looping, or kills, or cue points… that’s because none of this stuff exists. 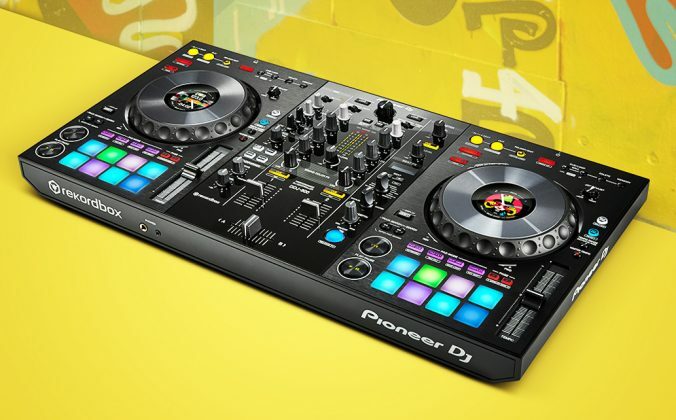 Imagine using a DJ mixer with a crossfader or two volume controls and nothing else – that’s what this software is giving you, but with the vital addition of remembering every mix and removing the need to actually perform the mixes in order to produce your mixtape. 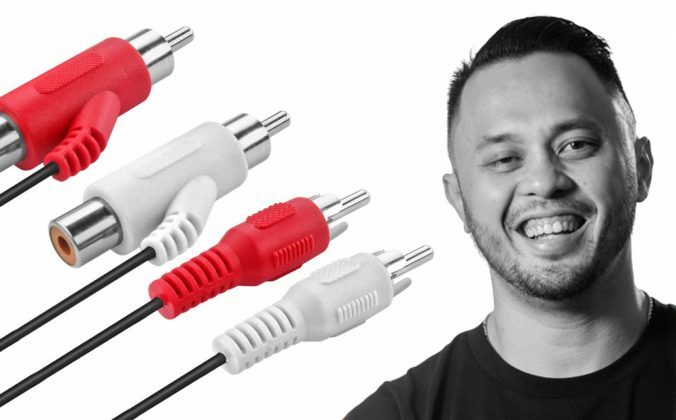 So, for making polished, distinctive, top-of-the-game DJ mixes of the type knocked out by pro studios in ProTools software and the like, it’s not going to be suitable. 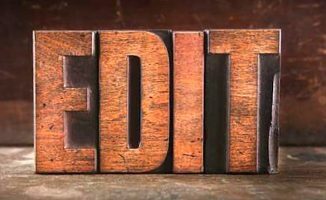 However, for certain types of DJs, and more importantly, for a certain part of the creative process, it’s actually a great idea. For instance, I’m the type of DJ who plays records more or less beginning to end. I am passionate about the order they’re in, and about getting the mixes timed perfectly, but I don’t fuss around with the tunes too much apart from that. To me, it’s the flow that’s everything. The way I make mixtape is to actually write out where the mixes are going to be on a piece of paper, and practise them. This software allows me to do that “live”, and then hear the whole thing in one go once I have. And there it is – done. No need to actually mix it with a record button on. Another example: Say you’re working on a new sound, because you’ve got 20 tunes that don’t fit your current DJ set, and you want to do a mix with them to see if it’s going to take your DJing somewhere interesting. With this, you can throw together an experimental mix, play with the order, listen to it, go back and swap them around, run off a copy for the car, come back and change it again… all the time, you’re working towards the perfect order for the final mix and deciding if it’s worth putting some serious time in to your new sound or not. It’s a massive timesaver. As I say my demo mix was for a radio station locally, and I wanted to showcase a slow, nu-disco, 80s-influenced Balearic sound with a view to doing a show for them. Remember, I started at 8am using this software for the first time. By 12pm, I had done it, listened to it, made a few tweaks, and uploaded it to MixTape’s server, and sent the URL to the radio station manager – done. 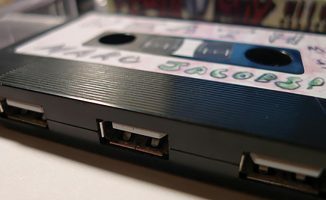 I did not want to go through the whole process of making a mixtape just for a speculative submission to a radio station – I just wanted to spend a morning banging the idea down and getting it over to them. I think the software worked excellently for this and saved me spending all weekend working laboriously on a mix that might lead to nothing. Listen to my MixTape demo mix here. This software is from a small developer in New Zealand, and has only been out for four months, in which time it has improved considerably. It has things I’d like to change: I would like the volume control issue sorting out, and I’d also like a way to “lock” tracks together that you know mix well, so you can alleviate the risk of accidentally undoing a mix you made that you know will make it to the final version. I would expect that – considering how young the software is – such things are being considered, and may well see the light of day. Obviously EQ would make it a contender for far more accomplished mixes too, but I suspect that’s not the idea here. I also think it would be great to be able to upload from the software straight to some other hosting services like SoundCloud and Mixcloud. SoundCloud integration really would be something. 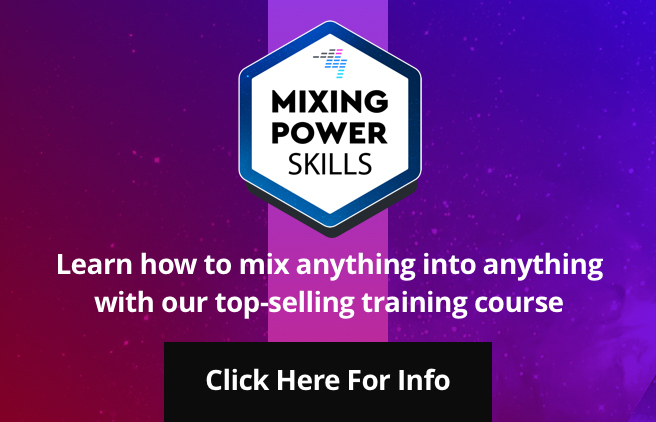 The software is selling itself on how easy it is to make mixes on it, andas I suspect many people will end up putting these mixes onto the established services, assisting them to do so could be a smart move. You can buy hosting credits at MixTape, but MixCloud is free (you can’t download from MixCloud, though, but nonetheless…). Finally, it was a little bit glitchy on my MacBook Pro 2.53 GHz Intel Core 2 Duo with 1GB of RAM – not bad enough to really annoy, but noticeable nonetheless. Overall, if you’re a DJ who broadly wants to produce passable mixtapes, and fast, and you’re happy to concentrate on the tune choice and programming (like the good old mixtape culture of the 80s) rather than on DJ tricks, for $69 this little piece of software is a steal. And if you’re a pro who just wants a scratchpad for ideas, again this could be a real timesaver for you. I can see myself using it to at least plan out all my mixtapes from now on. How do you sketch out your DJ mixes? 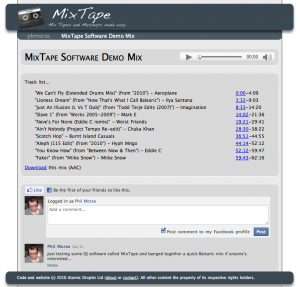 Have you tried the demo of MixTape? What are your thoughts? Let us know in the comments below. I use Acid Pro for the same purpose, works well and – important- fast. Is there any PC alternative to this program? Windows-Peeps should go with Acid Pro. It has a lot more features than Mixtape but you needn’t use them if you don’t want to. Even Ableton Live can get the Job done, although its not very intuitive for that kind of work. Absolutely fantastic review by Phil, but it focuses on only one software package that’s only available for the Mac! 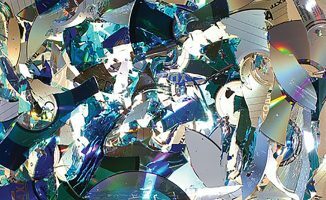 Some Artists and DJs are using PC, so would have been good to include a list of alternatives – or perhaps link to a review of a PC alternative. I don’t know of a PC alternative. Sorry, I meant “Mixed in Key”…not mashed in key.